Microsoft first introduced its Surface Dial accessory back in late 2016. At the time we saw some compelling demos of the turnable and clickable accessory with various artistic, technical drawing and even musical applications. The pioneering art apps for Dial support are Sketchable and Mental Canvas. However, the workhorse go-to app for many imaging operatives is Adobe Photoshop and proper support in that app, and others from the Adobe CC stable, would more likely make the Surface Dial an ‘essential’ in both production and creative studios. Yesterday at the Adobe MAX Creativity Conference in Las Vegas, Adobe unveiled the next generation of Creative Cloud software. 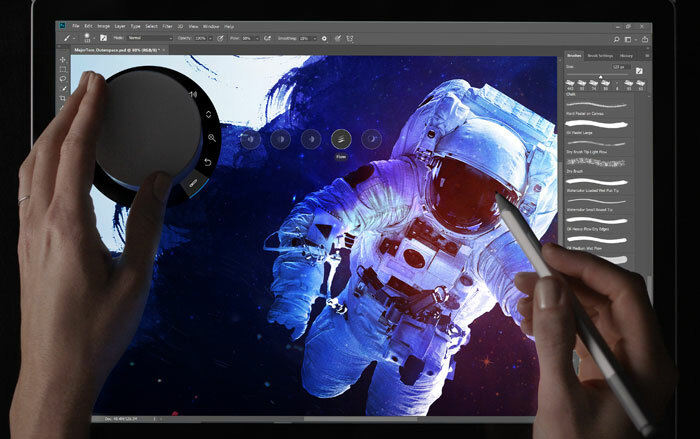 In some brief notes at the end of its event blog post Adobe explained that it was now supporting the Microsoft Surface Dial “a new hardware device, to change tool parameters without taking your attention from the canvas. Shipping as a tech preview turned on.” Adobe Premier Pro also supports the Surface Dial. The official Windows Blog has a little more detail. 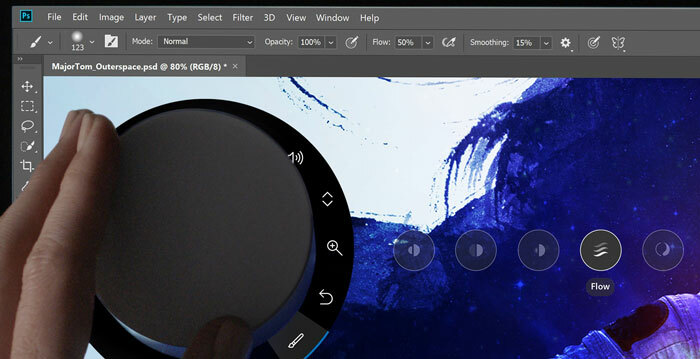 Previously Adobe Photoshop already offered limited support for the Dial – merely using it as a zoom tool for your canvas. With the latest update its utility is very usefully extended. For example, you will be able to use the dial to change brush settings like opacity, hardness, flow, smoothing and size by rotating the dial as you work. The implementations still sounds limited, with no mention of colour control, for example. However, as it is a tech preview feature, it is still being worked upon. The timing is good for Microsoft, its new Surface Book 2 machines support touch, styli and input dials and will be released from mid-November. Microsoft has announced it will offer a free three-month trial of the Adobe Creative Cloud Photography plan (with 1TB of cloud storage) with your purchase of a Surface between 18th Oct 2017 and 18th January 2018 (excluding China and India).